Ugh, if your like me and you live in a rainy cold state, then you are well aware that sweater weather is still in full effect. Not that I mind to be honest, what’s easier then throwing on a cozy chunky knit and some sleek leather pants and calling it good? Oh and did I happen to mention how great this look works for those bad hair days? Simply tuck your hair into your turtle neck and VOILA! Instant hair style thats effortlessly undone, yet chic at the same time! 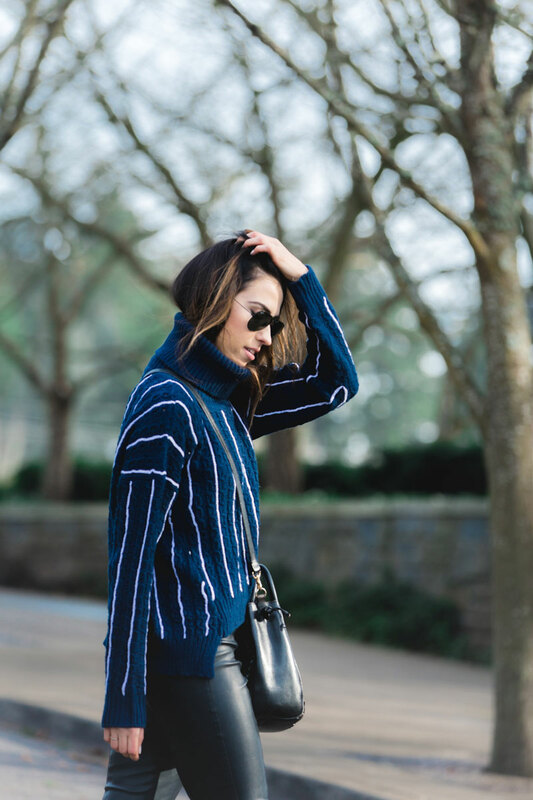 The amount of time spent on picking out an outfit in the mornings, and then of course the makeup, I can’t help but get a little excited when my hair becomes as easy as a tuck into a sweater’s neck! Posted in Looks.Tagged Asos, casual chic, Echic, evelina, fall winter style, fashion blogger, fashion marketing, fashion photography, fashion styling, fashion writing, my style, nastygal, Ray bans, street style, sweater weather, winter vibes, zara.Bookmark the permalink. It is wrong if you happen to depend on this way. Relying on weight-reduction plan will hurt your heath.